I couldn’t get a straight answer out of Jeremy about what he wanted for dinner on Father’s Day—he fed me that standard line about how anything would be fine because he enjoys everything I make—but when pressed, he indicated that Mexican would not be out of place. With a choice between salmon and whole chicken, I decided the latter would be more appropriately used for Mexican food and ended up adapting a Rick Bayless recipe for grilled butterflied chicken, rubbed with earthy spices and acidic vinegar and lime. I seem to be making some headway in the chicken butchery front: I managed to get the spine free (and squirreled away in the freezer for stock) without mangling the rest of the bird too badly, although I am still in awe of those Top Chef contestants who were breaking down entire chickens in 30 seconds flat. My chicken went in the oven rather than on the grill, since my little tabletop model doesn’t allow indirect cooking. It came out browned, crisp and fragrant, not to mention juicy. 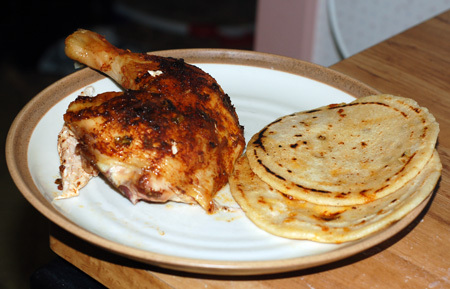 I wanted to play with masa, so I opted to serve my chicken with pupusas, a sort of thick corn tortilla that is stuffed before cooking like a built-in quesadilla. I had in mind the episode of Sesame Street where Murray goes to cooking school and makes stuffed corn tortillas, described as “very yummy things that we eat in Mexico” (and yes, I have seen all of these shows waaaaay too many times to count), although all the information I was able to find indicated that pupusas hail from El Salvador. I had never bought masa before and I don’t have a tortilla press, so this was all a big experiment for me. The dough itself was just masa and warm water, stirred together to attain a pleasant putty-like texture. I think I added a touch too much liquid, as my dough was very slightly sticky, but not enough to deter the process. I divided my dough into 10 portions and started stuffing them with shredded Cheddar cheese and sauteed onions. No wonder this recipe was demonstrated on Sesame Street: it felt a lot like shaping playdough. 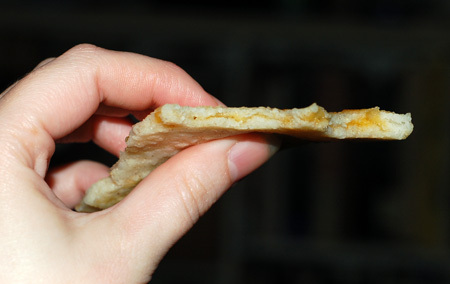 To flatten my pupusas, I used a folded sheet of waxed paper and the bottom of a dinner plate. I wouldn’t recommend this method for actual tortillas, since the rim of the plate kept the dough at least 1/8″ thick, but this seemed to work beautifully for my purposes, and gave the pupusas a slightly ridged texture that griddled up appealingly. 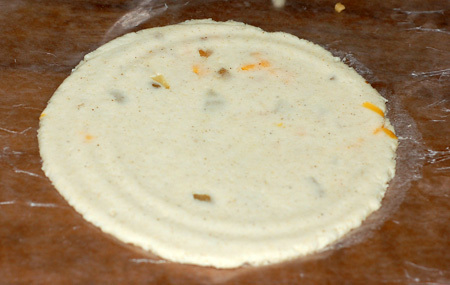 As you can see from the photos, most of my pupusas had some breaches where the filling was visible. Unless I was meant to leave them somewhat thicker, I’m not quite sure how that could be avoided, particularly with bulkier fillings like meat or beans. Still, I had several that were definitively stuffed, so I felt pretty good about it on the whole. To take a page from Murray the monster, “There’s cheese inside… don’t tell anybody!” They were tender and tasty, and paired well with the chicken, but I was really missing a vegetable: grilled scallions, some sort of salsa, or curtido, a salad of lightly pickled cabbage or other vegetables that traditionally accompany papusas. Nolan ate up his chicken, but started falling asleep before he had more than a taste of his pupusa, so we’ll have to try them again sometime. Jeremy, the man of the hour, enjoyed the whole meal, especially the fact that a butterflied chicken is less onerous to carve than a regular whole bird. Preheat your oven to 400F. Mix all the ingredients for the rub together in a small bowl. Brush the underside of the chicken with a bit of the rub, then turn it over and set it on the grate of a roasting pan, press to flatten, and tuck the wings back under the breasts. Brush with about half of the rub, and roast at 400F for 15 minutes. Reduce the oven temperature to 350F, baste again with the remaining rub, and cook for about 45 minutes more, covering with foil if the skin starts to look too dark. 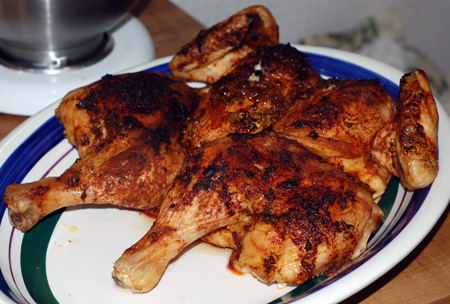 The chicken is done when an instant thermometer inserted in the thickest part of the breast or thigh reads 165F. Remove the chicken from the oven and allow to rest, covered with foil, for 10 to 15 minutes. Source: Adapted from Mexican Everyday by Rick Bayless, via Serious Eats. Put the masa harina and salt into a wide bowl. Slowly add about 1-1/3 cups of hot tap water, mixing as you go. 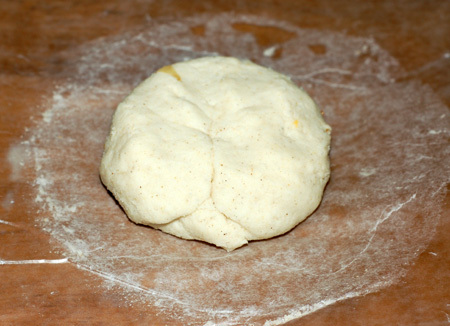 You should end up with a soft, putty-like dough, as soft as you can make it without it being sticky. Add more water if you need it. Knead well and form a smooth ball. Put the ball in a plastic bag and set aside for 30 minutes or longer to fully hydrate. Cup one palm slightly and dampen it with the lukewarm water. Take one piece of dough and put it in the dampened palm. Press down on it until you have a 3-inch round, which is slightly cupped because of the shape of your palm. If the edges break, fix them with dampened fingers. Now put about 2 to 3 tablespoons of the grated cheese into the cup. Bring the edges of the cup together over the top of the cheese and form a ball again. Press down on the ball gently to make a patty. Make 9 other cheese-filled patties in a similar manner and keep covered on a sheet of wax paper. The pupusas should be just slightly thicker than the tortillas. Grease the griddle or frying pan very lightly with oil before you cook each pupusa. They will puff up less. Cook the pupusas one at a time in a hot cast iron skillet that has been lightly greased, stacking them on top of each other in a warm oven and keeping them covered before serving. These can be reheated in a cast-iron griddle or cast-iron frying pan over medium-high heat, about 30 seconds on each side. You could also wrap all of them in foil and put the whole bundle into a preheated 350F oven for 15 minutes. Fill your pupusas with anything that strikes your fancy. Cheeses are traditional (queso fresco, Jack, cheddar), but beans or shredded meat are also common, and finely chopped sauteed or roasted vegetables such as onion or green chiles would not be out of place. Source: Adapted from Global Gourmet.